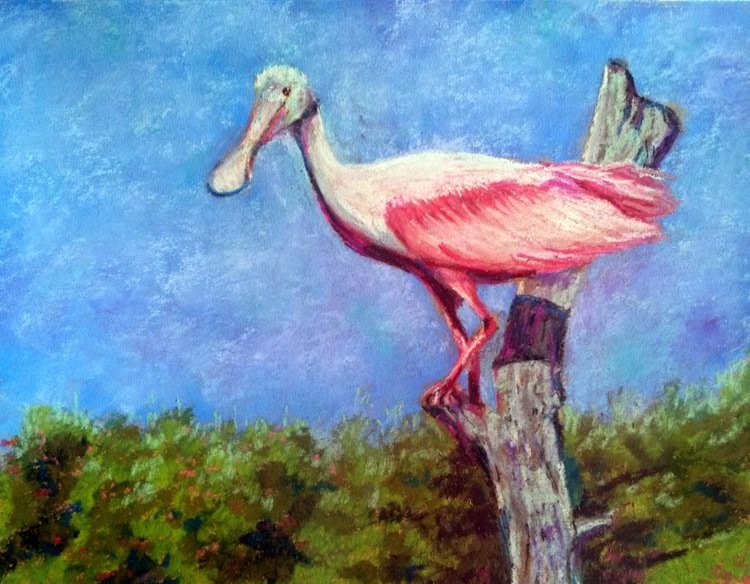 This is a painting I did from a reference I took in May 2012 when I went to High Island, Texas, at the tail end of the spring migration season. I went on a the last two scheduled walks for the season, and then drove down the coast along the Gulf to Bolivar Flats, and then took the ferry over to Galveston where I was meeting some friends for a cruise. I got 54 species for my Texas list, and added several new birds to my life list. I love spoonbills, both attractively pink, and yet also ugly and ungainly. And I loved this one sitting in an old dead tree. I had been thinking about doing this for our upcoming spring member show for the First Coast Pastel Society. But then last week I had a crazy fall and cracked or bruised my ribs and was in far too much pain to think about painting. But now, after 8 days, the pain is easing somewhat and I was able to sit down. Now that I've done it I'm not sure what I think of it - but I've reached a logical stopping point and have to let it sit for a day or two while I think about it. Done on 11x14 sheet of Richeson paper, sort of a creamy yellowing color.